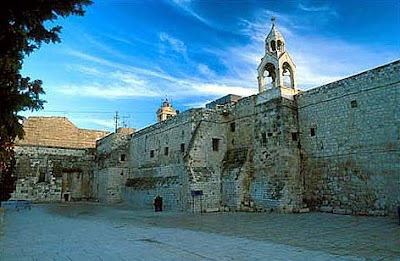 The Church of Nativity in Bethlehem is unquestionably one of the top tourist sites in the region, and obviously any holy land pilgrimage, any Bethlehem tour, but also other West Bank tours usually include a visit of the supposed birthplace of Jesus of Nazareth. The relevance of the site to pilgrims is obvious, but also architecturally, historically, culturally, and politically, this place is of great interest. Last Christmas a video from the Nativity Church circulated through the web and in many cases provided for a lot of laughter. In the video about a hundred clergymen of Greek Orthodox and Armenian denomination were seen, who, armed with brooms, started beating each other until Palestinian security forces intervened and managed to restore order. The background to this broom brawl was the annual cleaning of the church in preparation for the Orthodox Christmas celebrations. According to several media reports, a feud broke out when one monk provocatively started cleaning a part of the church that was supposedly under the responsibility of the respective other denomination and to clean a part of the church is interpreted as making a claim of it. Being asked about the event, an official of the Palestinian security forces reportedly only shrugged, describing the brawl as a “trivial problem that… occurs every year”. So fights like these are unfortunately not uncommon and basically reflect the difficulty of the three Christian denominations of Roman Catholics, Greek Orthodox and Armenian to share custody over the holy site. Even more dramatic, in 1853, the disputes among the monks provided the Russian Tsar Nicholas with a welcome excuse to attack Turkey, and thereby to start the Crimean War which lasted almost three years and led to the death over almost 400 000 people. The background was again very similar. The Russian backed Greek Orthodox monks denied their Roman Catholic brothers to place a silver star over the crib and to own a golden key to the church door. This once more led to a riot, during which several Orthodox monks were killed. Eventually, the Roman Catholics succeeded in placing their silver star over the crib and Tsar Nicholas blamed the killings on the Ottoman police in charge. He proclaimed himself the official protector of the Orthodox Christians and invaded the Danubian provinces of Turkey. Sadly, the disputes among the monks started to even endanger the site itself, which in 2008 was placed on the World Monuments Fund's list of the 100 Most Endangered Sites. Due to disagreements about which denomination is supposed to pay for urgent repairs, the roof timbers of the 1700 old basilica are rotting away. The water that consequently leaks in, further accelerates the rotting of the wood and endangers not only the structural integrity of the building, but further damages the 12th century wall mosaics and paintings. Again, to pay is to lay claim. For a long time, the Palestinian Authority has been promising to intervene into the rivalry for the sake of the church and in November 2011 stated once more that it will prepare for the restoration of the holy site on behalf of and in coordination with its three custodians. Throughout its long history the Nativity Church has seen numerous invasions and regime changes, has survived fires and earthquakes, and more recently in 2002, a siege, during which several Palestinian fighters hid in the church for 39 days and exchanged fire with the Israeli army, that had stationed itself around the site. Will it now fall victim to the disputes of those people who cherish it the most?